I often feel like I want to change up my breakfast routine to keep it interesting and this is what I did the other day. 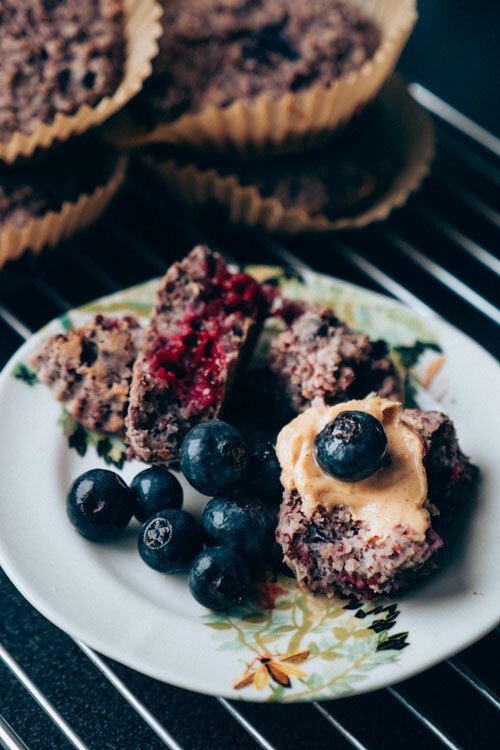 I never liked the idea of eating sweet or complete wheat muffins for breakfast but quinoa muffins, why not? Quinoa is great as it is a complete proteins o for a vegan you can’t start the day off better. This recipe offers two flavours, one sweet and one savoury. I like topping the savoury ones with cashew cheese or houmous and sliced tomato and for the sweet ones I like peanut butter (other nut butter) and jam or fresh berries. If you want something to grab and go in the morning or want something new to dip into your houmous pot at lunch these are perfect. The savoury ones are also lovely to eat with soups. Prepare them at night for the busy day ahead or make on a Sunday morning for a nourishing and luxurious breakfast. Quinoa is fantastic, I think I have said it loads of times before so I won’t go into too many details but this is just such a good source of plant protein! 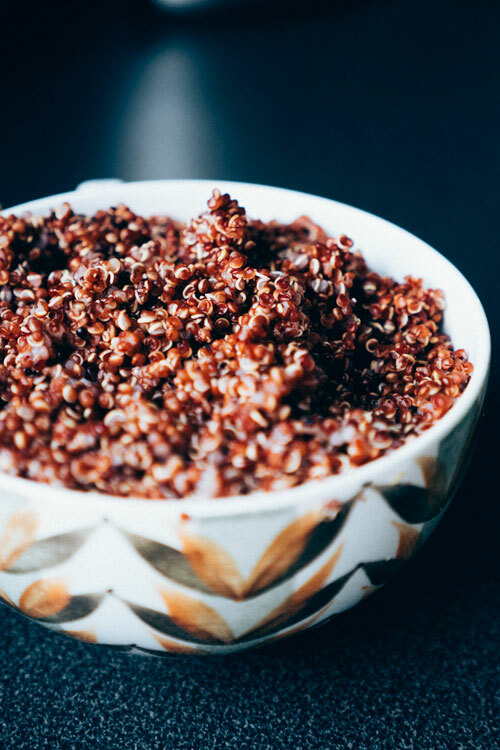 I used red quinoa for this recipe but I think any quinoa will work, although black will offer a more crunchy texture. 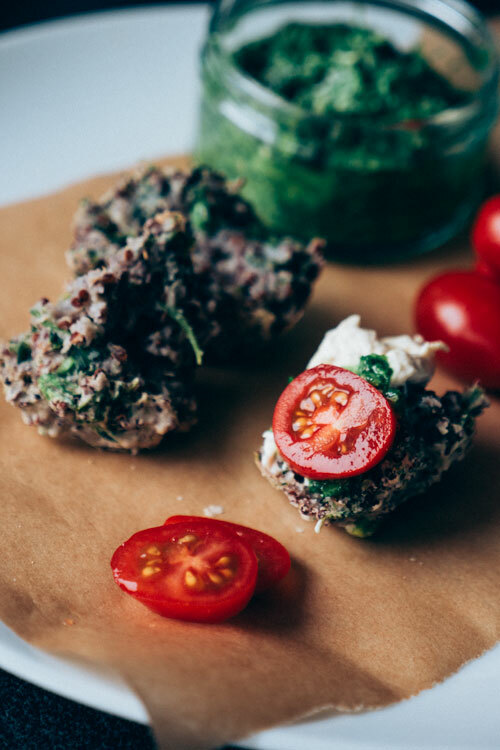 In this recipe I pair it with naturally gluten free flours like buckwheat and brown rice flour to make a hearty muffin. I know green juices are the thing right now and they really are fantastic but what about green muffins? I added spinach and peas to the savoury muffins for some green goodness as well as garlic for flavour and an immune system boost. 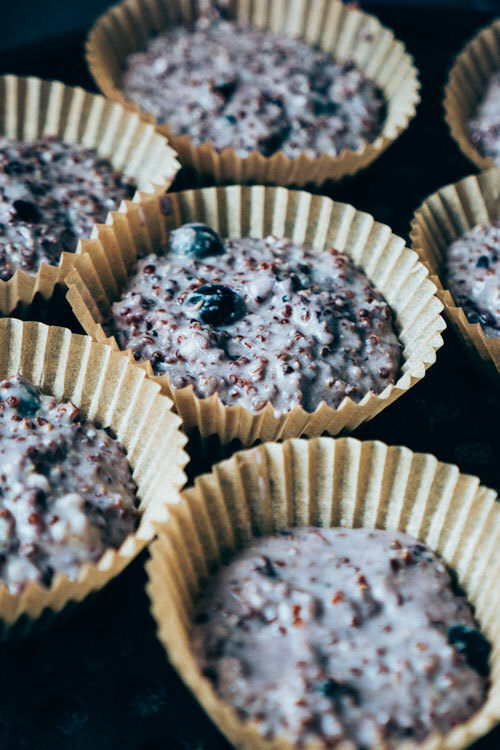 In the berry muffins I added rice malt syrup to sweeten and as I don’t really mind things being very sweet I think you need to experiment with this to find the right amount of sweet for you. I used ⅓ cup which was perfect for me. You can also use any liquid sweetener that you prefer; agave, maple syrup etc. Dried fruits instead of berries would also provide a more sweet result. Makes in total 16 muffins, 8 of each flavour. Active cooking time 25 min, total cooking time 55-65 min. Requires muffin tray or muffin moulds. 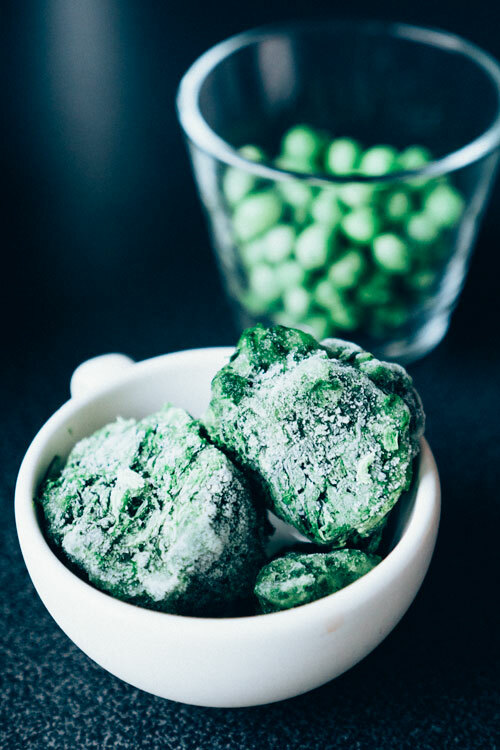 Defrost frozen spinach and peas (or use fresh). 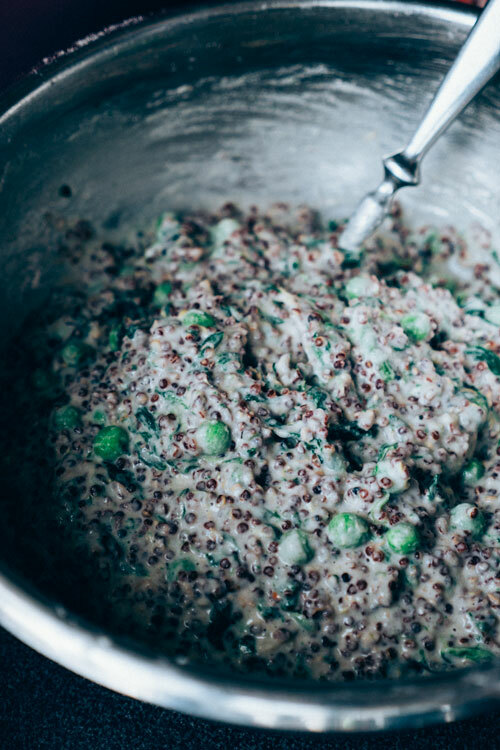 Cook quinoa (1 cup quinoa +2 cups water). Prepare flaxseed and water mixture – set aside. Place baking paper into muffin tray or place 16 muffin moulds onto oven tray. Mix quinoa, flours, baking powder and soda. Split mixture into two bowls and add remaining ingredients into separate bowls. Split the flax seed mixture in two and add to separate bowls. Mix with a spoon until completely combined. Place mixtures into muffin tray/muffin moulds considering that they will not rise much. Bake in oven for 30-40 min. Enjoy on the go or share with friends and family for a home baked weekend breakfast, finish leftovers dipped into soup or broken into yoghurt!